This picture shows most, but not all, of the Main Men of the Rat Roadshow (in particular apologies to Brendan and Craig, two of the Brad's, for not making it here, perhaps I didn't phone you!). Yours truly is standing in the middle of this photograph, apparently suffering from heartburn but in reality worrying whether the camera is working or not! Dave Gee ("Z51"), Gary Morris, Dave Craik, Mark Bennett ("No.1"), David Williams ("Mr. Shrewsbury"), Alan Baylis, John Cowburn ("P51"), Phill Taylor ("Heckmondwick") and Nick Lawford. 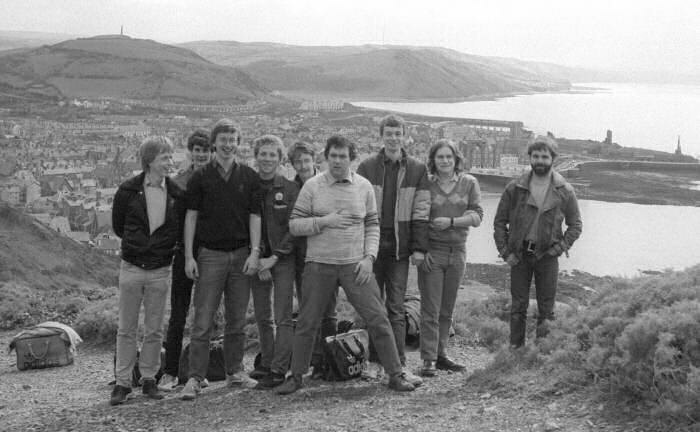 The photograph was taken from the top of the hill overlooking Aberystwyth on the 6th May 1985. We had spent the day there having arrived with 25058 and 25078 heading the Euston - Aberystwyth excursion train. Unbeknown to us this was to be our penultimate visit to Aberystwyth.